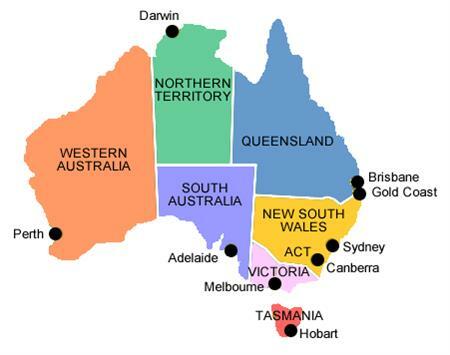 Places to see and things to do whilst travelleing around Australia. Australia has the highest incidence of sun caused cancers in the world The southern hemisphere sun is much more intense than the northern hemisphere and you can do a lifetime of damage to your skin and eye's if your not careful. In Australia the term slip, slop, slap has been coined to remind us about the sun's danger if we don't take precautions when going out into it. Even overcast day's are dangerous as the damaging ray's still get through causing painful and damaging sunburn. So, Slip on protective clothing, Slop on some sunscreen and Slap on a hat. There are a small number of towns in Australia whose names have such a potency and such a power of association that they automatically conjure up images. The name 'Marble Bar' is synonymous with mining, isolation and, most importantly, heat. It is known as 'the hottest town in Australia' a fact which is still recorded by the Guinness Book of Records. For 161 consecutive days to 20 April 1924 the temperature in the town never dropped below 100°F (37.8°C). This record still stands after nearly seventy years. During all the time that records have been kept the temperature at the town has never dropped below 0°C. Karijini (formerly Hamersley Range) National Park is the second largest national park in WA. A party led by explorer F.T. Gregory explored the area in 1861. He named the Hamersley Range, on which the park is centred, after his friend Edward Hamersley. Situated just north of the Tropic of Capricorn, the park's climate can best be described as tropical semi-desert. A highly variable, mainly summer rainfall of 250–350 mm, often associated with thunderstorms and cyclones, is accompanied by temperatures frequently topping 40 degrees Celsius. The ideal times to visit the park are late autumn, winter and early spring. Winter days are warm and clear, but nights are cold and sometimes frosty. Called the East Kimberley the list of unique landscapes in this amazing part of the world along with the work opportunities for working holiday makers make this destination a must for any traveller wanting a truly unique Australian Outback Experience. Most of the 200,000 hectare Millstream-Chichester National Park is a landscape of rolling hills, spectacular escarpments and winding tree-lined watercourses. The Chichester Range rises sharply from the coastal plain and includes rocky peaks, tranquil gorges, and hidden rock pools such as Python Pool. Scattered white-barked gums and spiky spinifex clumps cover the stony plateau, which gradually slopes down to the bed of the Fortescue River. Mount Augustus, or Burringurrah as it is known by the local Wadjari Aboriginal people, is about 850 kilometres from Perth and midway between the Great Northern and North West Coastal highways. One of the most spectacular solitary peaks in the world, it rises 717 metres above a stony, red sandplain of arid shrubland—dominated by wattles, cassias and eremophilas—and is clearly visible from the air for more than 160 kilometres. Southern Gateway to the Kimberley region of Outback Western Australia. Established as a pearling port in the 1880s it attracted a diverse multicultural of personalities many hoping to make their fortunes from the pearling industry. Today, though pearling (cultured) continues to be a major industry it is tourism that has set off an explosion of economic activity and population growth.